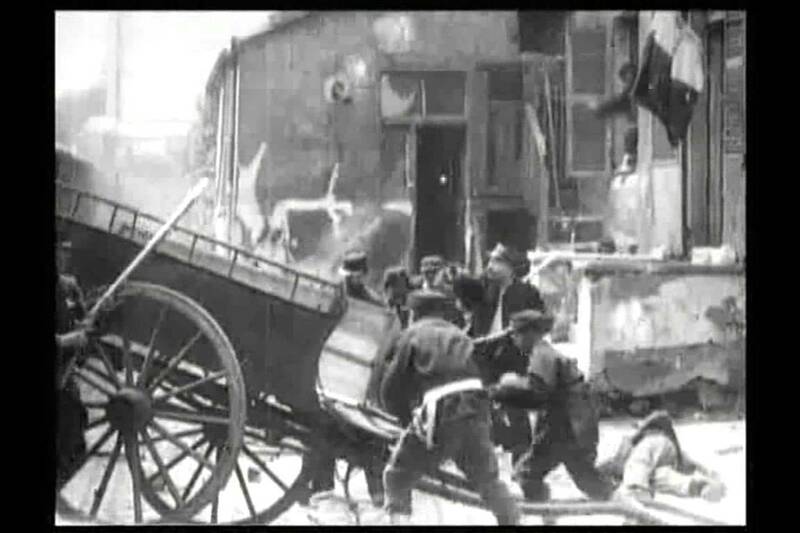 This short scene from Alice Guy may reflect the popularity of American war films at the time. While the Americans had their own real war to shoot (the Spanish-American War), the danger of conditions and limitations of the technology resulted in most of their combat scenes being re-enactments. Well, France had plenty of historical and patriotic wars to re-enact, and that is what Guy has her actors do here. We see the front of a house on a snow-covered morning. A lone guard stands next to a small cannon, or possibly a Gatling gun or similar weapon. A group of soldiers in different uniforms sneak up behind him and one of them shoots him from behind. Now they all run around to stand before the camera and exchange fire with the soldiers who come out of the house to investigate the shot. They soon retreat and the defense force uses the gun to frighten them and also engages in pursuit. An officer, with a sword and side arm instead of a rifle, waves his arms and tries to direct the soldiers. Suddenly, the enemy reappears, pushing a large wagon in front of them for cover. They fight with the officer and his few remaining men, the officer cutting several down with his sword. When the film ends, the fighting is still going on. This movie made no immediate sense to me, and I had to do a certain amount of digging before the French Wikipedia informed me that it is a re-enactment of a battle from the “War of 1870” (known to Americans, if at all, as the “Franco-Prussian War”). I’m not good at identifying uniforms, but I believe the French are the defenders in this sequence, which may explain why the heroic officer isn’t cut down for his rather foolhardy sword attack on men with guns. The apparent snow on the ground threw me as well – the only war I could think of where cold weather was a factor was Napoleon’s disastrous invasion of Russia, which didn’t seem like an uplifting subject for a French filmmaker. 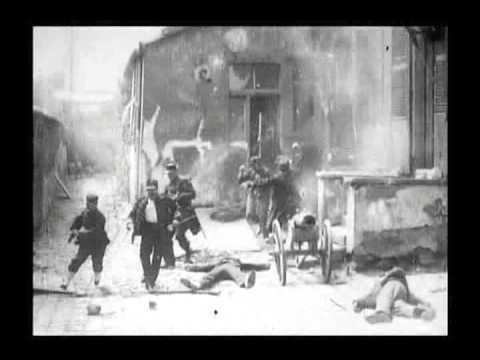 Of course, the French lost the Franco-Prussian war as well, ultimately, but this version of events allows the viewer to focus on the individual heroism of the soldiers and on the aspect of defending against a ruthless enemy (willing to shoot a man in the back, for instance). As compared to other war movies I’ve seen from the time, this one is pretty exciting: keeping up the action consistently throughout and using the stationary framing to add a degree of suspense – when the soldiers run on and off camera, we imagine the battle expanding, and wonder when the next attack will come on screen. You can watch it for free: here (no music) or here (with music).